For many of us in the DevOps field, MongoDB is a critical part of our IT stack. It would be an understatement to say that MongoDB does a lot, with many organizations using it as their backend storage framework, analytics backend, and so on. So your MongoDB cluster really, really needs to be in tip-top shape. All the time. And if it’s not then you need to know asap — or better yet — prevent problems before they kick in and make your life difficult. 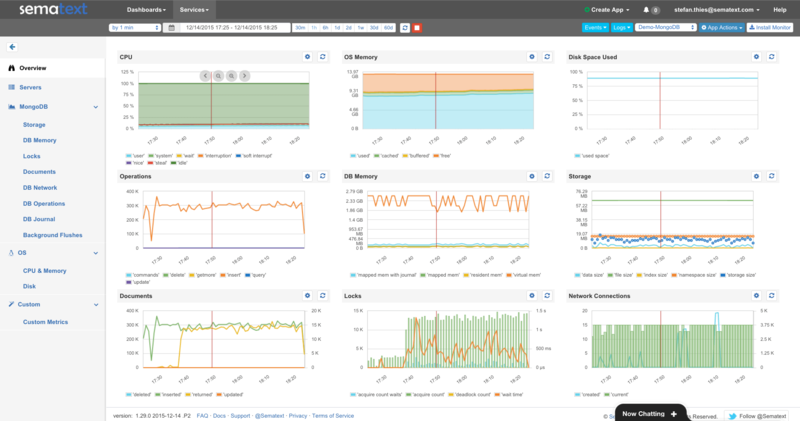 That’s where Sematext Cloud comes in — with MongoDB monitoring, anomaly detection, and alerting. MongoDB exposes a boatload of performance metrics, but instead of just throwing all of them on endless charts, we’ve taken the time to cherry pick what we think are the top 50 most valuable MongoDB metrics to monitor. We have furthermore made it possible to filter the MongoDB metrics by server, as well as a database and table where possible. Row 2 displays Database Operations, Database Memory and Database Storage Metrics. The Reports on the left side of the screen below provide detailed information for each group of metrics. Let’s have a quick look at them. Locks: Lock counters and lock acquisition wait times for Global, Database, Collection and Journal level. Since MongoDB 3.x Locks are not always global. Sematext shows a breakdown for all lock types. These metrics are good candidates for alerting, when anomalies are detected. Simply add an alert from the menu in the top-left corner in each chart. We hope you like this new addition to Sematext. Got ideas how we could make it more useful for you? Let us know via comments, email or @sematext. Not using SPM yet? Check out the free 30-day trial by registering here. There’s no commitment and no credit card required. 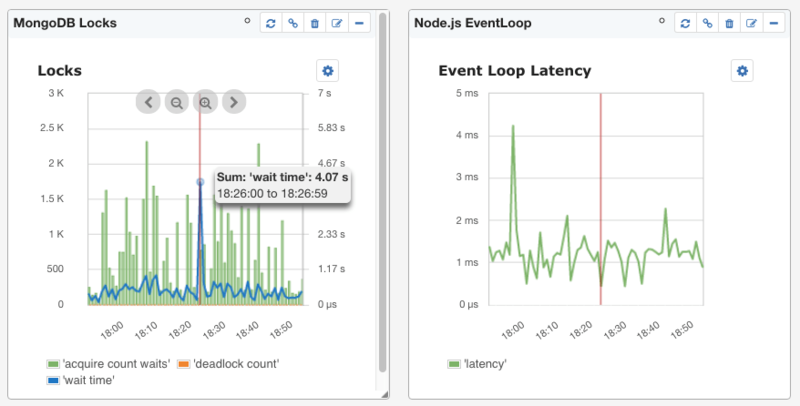 Even better — combine Metrics with Logs to make the integration of performance metrics, logs, events and anomalies more robust for those looking for a single pane of glass.